Many people decide to start their own businesses because they’re intrigued by the idea of being their own boss. All decisions, risks, and rewards are yours and yours alone. This equation changes, however, when you decide to start and run a business in partnership with another person. Many of the freedoms, risks and rewards are similar – but there are unique questions that business partners should ask each other to help ensure the relationship starts and continues smoothly. Before and during the process of developing a business partnership, it is crucial to ask and answer the questions below. What goals do I have for this business? What goals does my partner have? What if one partner wants to create a business that will provide income for his family for several years or decades and the other partner wants to build a company that will grow quickly and sell well? These are not necessarily incompatible goals, but it is important to get these goals onto the table to discuss how to start and run a business that might meet both partners’ goals. What is each partner’s level of commitment in terms of time? You can prevent a major source of partner conflict by being explicit about how much time each of you expects to spend working on running and developing the business. Will either of you work full-time for your business at the beginning? Will either of you have other work commitments? If so, are there any situations in which that partner will close out other work or business commitments to focus more energy on this endeavor? How will cash invested by partners be treated? Will cash investment be treated as debt to be repaid? Will cash investment buy a higher level of company shares? Will the debt be convertible? These questions and answers also have tax implications, so it may be wise to consult a certified public accountant along with a qualified business law attorney during your start-up phase. How comfortable are we with change? Change is the only constant in any business environment, and the most successful businesses are those that are highly adaptable to change – in the market, in the economy, in the personnel, etc. That said, business partners should have a conversation about their “sticking points” – those aspects of the business that one or another partner does not want to change. One partner may be fully committed to the specific product being produced, whereas another partner may be unwaveringly dedicated to a certain market segment. Learn each other’s “sticking points” now to minimize conflict during the inevitable periods of change and adjustment as the business ages and grows. How much will we pay ourselves? Who has the authority to change compensation amounts in the future? This issue is related to the question of who is investing how much cash into the business during the start-up phase. Compensation can be a volatile issue. Regardless of how difficult the conversation may be, partners must thoroughly discuss pay structure at the very beginning of a business relationship to minimize conflict down the road. Who will own what percentage of the company? In other words, how will we divide the shares? The answer to this question often depends on whether one or both partners provided cash for start-up costs, as well as the time commitment each partner plans to make. Who has what kinds of decision-making authority? The answer to this question often is related to the division of shares between the partners, but this is not a requirement. You can designate shares as voting shares or non-voting shares, and you can also choose to set up a board of directors. The partners will have to decide which areas, if any, they each have individual authority over, which areas they must agree on, and which areas the board of directors will control. Common areas of decision making authority include human resources (hiring and firing), capitalization, issuance of shares, and mergers and acquisitions. Will we sign contractual terms with the company in addition to the shareholder agreement and partnership agreement? 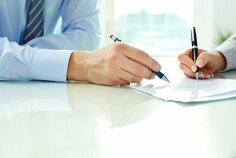 Two common examples of additional contractual terms are the non-compete agreement and the confidentiality or non-disclosure agreement. If founding partners are going to sign such contracts, what will the terms of each agreement be? What if one or both of us wants to leave the company? It is better to define exit procedures in the early stages of the business start-up. If no guidelines are in place, one partner’s desire to depart can cause high conflict as formerly aligned partners try to come to agreements about ending their relationship. Can either of us be fired? If so, what are the grounds for termination and who has the authority to make that decision? What is the procedure? Discuss and commit to writing your strategy for terminating the operational role of a co-founder if necessary. What is our business succession plan? While it is not necessary to have a fully developed and executed business succession plan before starting a business endeavor, it should at least be a topic for discussion in the early stages. Partners may have different ideas about how control over the business will pass to others in the future, and a conversation about succession planning can reveal these differences and give each partner food for thought as a plan is developed. Have several conversations about these topics, and you will find yourself well prepared when it comes time to put your partnership agreement into writing. As always, an attorney knowledgeable in business law can be an invaluable advisor and resource to your company.